I was kidnapped two Saturday nights ago. It actually wasn’t really that dramatic, but I was definitely taken to a place that I would never have knowingly agreed to go. 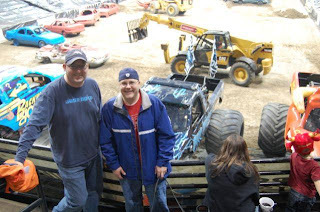 Flash back a few weeks ago, my friend Doug and I were at a lacrosse game and somehow the subject drifted to Monster Trucks. I went on for ten minutes about how ridiculous I find the entire notion of Monster Truck Rallies. Words such as mindless, stupid, and lowest common denominator were bandied about liberally. 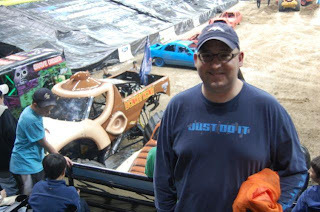 In no uncertain terms did I leave my opinion unclear on my general feelings of superiority over Monster Truck devotees. I was quite thorough, some might even say ruthless, in my dismissal of the whole genre of entertainment. Apparently my friend Doug took this as a personal challenge. He admitted that he has a fondness for this silly form of amusement, and decided that my life would be incomplete without the obligatory Monster Truck experience. Earlier in the week while watching a Nuggets game, I noticed a television commercial for Monster Jam and gave it little thought other than to be amused by the fact that they advertise that “KIDS SEATS ARE STILL JUST 5 BUCKS!” (What they don’t tell you is that once you get your kid there for just five bucks they will shamelessly promote all of their Monster Jam merchandise and create a guilt trip type situation where if you don’t give in to your pleading children and buy your kid at least $50 bucks of product that you will be made to feel like a failure as a parent.) I noticed the commercial and filed that away somewhere in the back of my mind, but didn’t really give it a second though due to the fact that there are insufficient forces in the universe that would compel me to purchase tickets to Monster Jam. This brings us to Saturday night at about ten minutes until six, my wife works on Saturdays until six o’clock at night, and then she has a twenty minute drive to our house after she completes her shift. Yet, at 5:50 PM someone was walking into my house, and I was pretty sure it wasn’t her. I wasn’t expecting guests, so my first thought is panic that some weirdo is breaking into my place to make off with my meager possessions. I wasn’t too keen on this situation, so I rushed to the kitchen to see what was going on. Turns out I knew the weirdo who was walking into my house, it was my friend Doug with his wife Katy. Doug looked at me and said, “Get your shoes on, we’re going out.” I was confused, as I wasn’t planning on going out, but I was also relieved to find I knew the intruder. “Does my wife know about this?” I had to ask, because usually if I was planning to hang out with my friend on a Saturday night, some planning had to be involved as I was taking care of my two young kids who were both napping at the time. He assured me that my wife was on board and that Katy was going to watch our kids until Jen got home, at which time the women and children were going to eat dinner together. That sounded fine to me, and having a boys night out sounded quite good to me, but then I started to get suspicious. I have to say that was a little weird to me as I couldn’t figure out why our destination would be a secret, but I was excited. Although as my wife can attest, I am not a big fan of surprises, I was intrigued at this mystery. We walked out to his van and I got in. My first guess was that perhaps we were going to Comedy Works, but it didn’t make sense that he would keep such information a secret. Then I began to think critically, “What would Doug want to take me to that he wouldn’t want me to know about beforehand?” It was at this very moment that I remembered the Monster Jam commercial from the Nuggets game. Less than two minutes away from leaving my house and I had figured it out. “We’re going to the Monster Trucks, aren’t we.” I asked him in a half amused, half incredulous tone. I had to admit, he got me. I could whine about it or just go with the flow and have fun. I decided that the later approach would make for a better evening, so I laughed along and decided that I would attempt to enjoy the evening on an ironic level. After a quick dinner at Quiznos, we were on our way to the Pepsi Center for an evening of Monster Truck madness. As we arrived at the Pepsi Center, my hopes for the evening rose, as I saw the clientele who were making their way to the arena. I started to figure that I could enjoy this night just by people watching. There were people there wearing mullet wigs to be funny, but there were others with authentic mullets who didn't find the hairstyle nearly as amusing as I did. There was camouflage and Bass Pro Shop gear everywhere, bright orange hunting vests were worn proudly over ripped Camel cigarette T-Shirts. I quickly surmised that much more entertainment value could be obtained by watching the crowd than by watching the show. We met up with Doug’s brother Josh and his friend at the doors, and as we entered the arena a few minutes before the show, Doug handed me some earplugs which made me a little nervous that conversation would be impossible due to the raucous nature of the program. We made our way to our seats as Josh’s friend regaled us with stories of the awesomeness of Grave Digger. 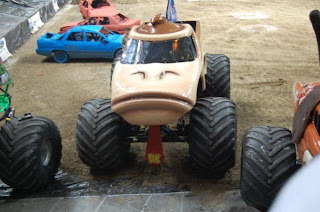 (One of the more popular Monster Trucks) Obviously, I was a skeptic amongst three believers. I didn’t yet believe in the power of Monster Jam, but I was willing to give it a chance, even though my initial thought was, “This is retarded.” Thankfully, the earplugs turned out to be unnecessary, as it wasn’t nearly as loud as I feared. It was loud and obnoxious, but not intolerable. I think Doug is overly cautious due to the fact that he has had a long history of ear problems and has had over a hundred thousand dollars worth of ear surgery (mostly paid by insurance, thankfully) in his history. This makes his aversion to loud noises understandable, but since I do not share the same issues, it didn’t seem to be a problem to me. Okay, I have to make a few comments on the transformers. First off, they were extremely lame. Perhaps in 1986 this would be intriguing stuff, but after seeing the Transformer movie, I am thinking that taking five minutes to transform from a funky looking car into a fire breathing dragon doesn’t really captivate. Maybe if I were eight it would transfix me, so I’ll reserve judgment, but it didn’t do much for me. I definitely have to take umbrage with the “battle.” It consisted of the good robot and the bad robot (who both had the exact same robotic sounding voice, by the way) talking to each other about how they will destroy each other, followed by goofy explosions which were set off to mimic laser fire, and the battle ended with the good robot “shooting” the bad robot and a chuck of the bad robot falling to the ground. Then they both transformed back into cars and drove off. The final event of the night was the “Freestyle Competition” which basically consisted of the trucks driving around and jumping over ramps for a minute each. There were six trucks, and they all had there different personalities. There was Grave Digger, of course. Then there also was Blue Thunder which was basically a Ford commercial on wheels. There was El Toro Loco, which was basically a red truck with horns, there was Backwards Bob which was a truck that had been put together backwords so when it drove it looked like it was going in reverse, There was Monster Mutt a truck which had big dog ears and a dog tongue, and then there was my favorite, Donkey Kong which was designed to look like the Nintendo video game character. They all took their turns in the Freestyle competition, with Grave Digger going last and appearing like the whole show was fixed for Grave Digger to win as it was the most popular truck and it’s jumps were the highest, except that after the first twenty seconds or so, Grave Digger broke an Axel and couldn’t go anymore, so El Toro Loco won by default, and on that low note the whole show ended. It was moderately entertaining, but I certainly never would have paid the 19 dollar ticket fee, and will probably never go again. But Hey, I can now say I have attended a Monster Truck show, so I guess that’s one less thing for me to have to do in my life to feel complete. On a related note, Doug and his brother bought tickets for the National Finals Monster Jam show in Vegas, so apparently it was more engrossing for some than others! In this photo, I am experiencing symptoms associated with Stockholm Syndrome, as I am beginning to identify with my captor.